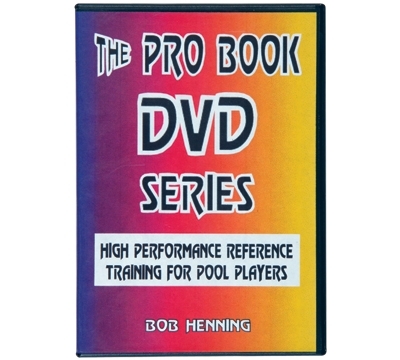 PV85 – Henning's "The Pro Book DVD Series"
New from the author of the popular training resource "The Pro Book", The Pro Book DVD Series is intended as a complete, on-the-table training system. The videos can be used in conjunction with "The Pro Book"Click here for "The Pro Book" or independently. Each DVD is close to an hour in length, digital and in full color. Learn the training guidelines to revolutionize your practicing. Practice the 14 most important extended shots and the 16 root shots of position play. Understand the shot window concept and simplify your shot selection process. Master the 22 boundary shots and extended boundary shots. Discover the seven principles and eight strategies of kick safeties and stun your opponent with your comeback ability. Master the 12 most crucial kicks and be able to fight back with your confidence intact. You may mix and match any regular-priced videos on this website to achieve quantity discounts.